I Have Run: Run for Another: Janji Review and Giveaway! I am picky about what I wear running. If I love something, it becomes a regular part of my rotation. If I don't, it either sits in my closet untouched or gets worn once in a while for a short treadmill run or on a cross training day. I recently received two additions to my running wardrobe that have been added to the regular rotation. Janji sent me shorts and shirt to try out. 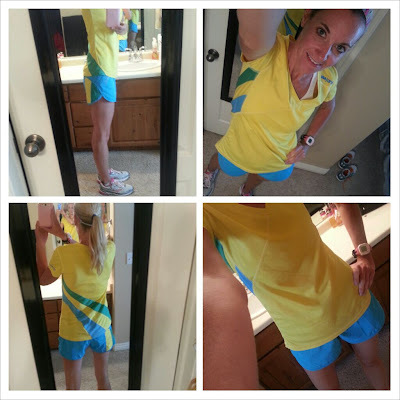 The shirt is the first yellow addition to my running clothes. I love it. It fits great, and it doesn't make me hot (and I've worn it on two pretty toasty runs). And the shorts remind me a lot of my Lululemon shorts, which are my favorites! Not only does Janji make great running clothes though, they began the company with the promise to "use the power of running to create a healthier and happier world." It is doing this by donating a portion of proceeds to fund organizations that are alleviating the worst problems related to food and water in countries like Kenya, Bangladesh, Haiti and more. By funding solutions and raising awareness through its apparel, Janji wants to create a nation of runners that run for another and eliminate the global food and water crisis. Janji's clothes are competitively priced and are high quality. And they come in awesome colors! You can find a list of local running stores that carry Janji apparel HERE or you can order online HERE. And you can get a $25 gift certificate RIGHT HERE. On MY blog!! The winners of the gift certificate and the water bottle will be selected by Random.org on Wednesday, June 10. I like them on fb and follow them on twitter. I like all the clothes they have. Very cute stuff. I follow Janji on Facebook, and I really like their Rwanda women's outfits. My favorites are the Women's Bangladesh Running Shorts and Women's Logo Singlet. Thank you so much for not only offering such a wonderful giveaway, but also for introducing me to Janji. I follow Janji on Facebook as Cindy Aiton. I follow Janji on Twitter as @normawatson. I follow Janji on Facebook! I follow Janji on Twitter too! I like the Women's Logo Singlet! I like the yellow outfit but like the Haiti since it goes to Haiti. I like the red and turquoise color combo like in the Haiti shirt. Plus giving water to Tanzanians...very cool! Oh, and following them on FB! Checked out the site and I really like the birds and the shorts pretty much look identical to lulu. Liked them on fb! :) You look great in the clothes by the way. Love ya! I really like the Rwanda shirt. Nice yellow. I follow Janji on Facebook. I follow Janji on Twitter. I follow amd shared on FB! Loving the Rwanda shirt and shorts. I like the Haiti running shorts for my husband. Great giveaway, and awesome company! I also like the Rwanda shirt!